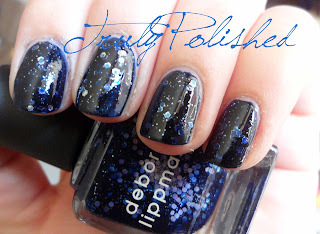 Today I have an actual NOTD (Nails of the Day) post for you! When I first started my blog, all of my posts were of the polish I was wearing that day, or the day before, because that's how I found it easiest to do my photos. Now since my boyfriend is home I've been swatching as much as I can in one day so I have less things to do and more time to spend with him. This means that I've been able to have a balance of painting my nails and giving them a break to stop them going yellow! Last night I painted my nails with HITS Air Glow for a post, then decided to layer Afterglow on top to give it an extra something and keep it on. The only problem with that was that my nails felt so thick that I took it off first thing this morning. I was wearing a navy blue top to the zoo today so I decided to match my nails. I chose an untried in my stash that I got from Taryn, a polish buddy of mine, in a Fantasy Fire swap a while ago. Lady Sings the Blues is a navy blue jelly with silver microglitter and larger hex glitter. This came out in 2010 I believe, but there's no way I'd have bought it then as I was a very poor student... 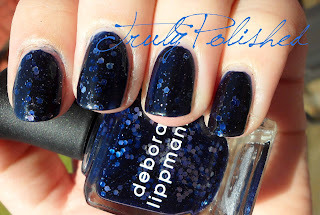 They only sell Deborah Lippmann in House of Fraser here (I think) and it retails for around £16, which is A LOT OF MONEY! I don't have anything close to this in my stash, nothing at all. Not even a true navy like this! What I love about this polish is the application was amazing. It went on so easily, almost opaque in one coat and the glitter went on really evenly. This looks so pretty on because the blue jellyness kind of covers some of the silver glitter, so it looks a bit like a glitter/jelly sandwich! 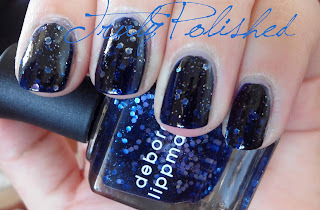 Here are some photos, here you can see two coats of Lady Sings the Blues with one coat of Seche Vite. In future I'll use two coats of Seche Vite because I still had texture issues with this! I'm in love with this polish! Taryn, thank you so much! I adore this, and I definitely think it's worth the price tag! Usually I'm against the really expensive brands because I don't think they're any better, but this formula!!!! Maybe it was a one-off and the rest of the polishes don't apply like this, but this is amazing!